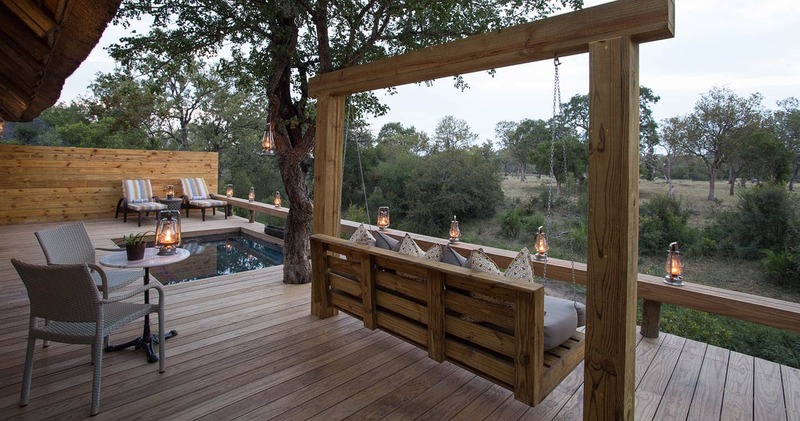 Simbambili Lodge is situated among dense stands of knobthorn and jackalberry trees along the meandering Manyeleti River in the Sabi Sands Game Reserve, part of the world-renowned Kruger National Park. With its Morroccan-styled suites that have been sensitively designed to blend with the environment and carefully positioned to enhance privacy, this is a must for the romantic at heart. 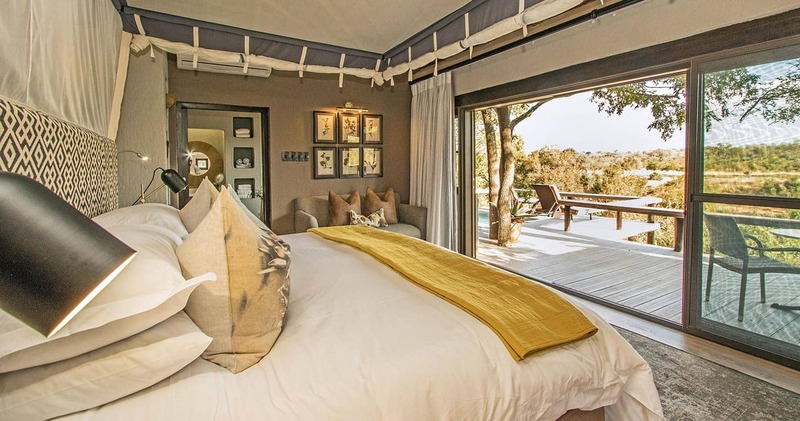 Each suite with its own plunge pool and Sala overlooking the watering hole. This exquisite Lodge is famed for its regular leopard sightings and abundance of general game species as well as extraordinary bird life. With the lodge accommodating a maximum of 16 guests, public areas carefully designed to resemble hospitality akin to a comfortable home with specially prepared meals and venues for entertaining and relaxation. Sophisticated yet simple, each suite has spectacular views over an extensive savannah grassland that teems with wildlife, as seen from the unique en-suite bathrooms and salas or from individual private plunge pools (source). The day starts as dawn breaks over the African bushveld. After your early morning wakeup call. Shortly after, you depart in your open landrover with your experienced rangers and trackers who will share their extensive knowledge of the bush with you. These drives are undertaken at times best suited for game viewing which vary depending on the season but typically start early morning. Where applicable you may be invited out of the vehicle to see tracks, examine certain plants and follow spoor. After an exhilarating hunt for tracks to see what the animals have been up to during the night, and tracking down whatever you find, you will stop somewhere out in the bush for a break of coffee & tea. Time to stretch your legs whilst having your sunglasses cleaned and indulge in cool towels in summer, and hot towels in winter. In winter, you are kept warm on the vehicle with hot water bottles and warm blankets. After a sumptuous Breakfast is served either back at the camp or in the riverbed or bush, you are offered walks to suit their interests and fitness levels and are accompanied by an armed ranger and tracker. Walks allow you a better chance to see some of the smaller creatures of the bush as well as an opportunity to learn more about the flora and fauna of the region and to have a chance to follow tracks in more detail. The Shangaan trackers will enthrall you with their explanations of the medicinal and other uses of the numerous plants and trees along with tales of traditional folklore. The rest of the day is spent at the discretion of yourself for other activities that are on offer, with a late lunch served around 15h00. Lunch is followed by the afternoon game drive and extends into the evening to view seldom seen nocturnal species by torchlight (source). I was exceptionally fortunate to spend my birthday at Simbambili. From our arrival to our departure, everything received a 100% rating. The staff were all amazing and their hospitality at all times was exceptional. Our room was fantastic with it's own pool, deck and a large "outdoor bed" to lie and watch the birds right in front of us. The drives were amazing and we saw the Big 5 and such rare sights as a pack of 7 wild dogs. Meals were an absolute treat with the staff going out of their way to ensure we had everything we needed (and all so healthy). The bush walks were so informative and a thrill too. Whether you are a South African or a visitor making their way to Africa, ensure Simbambili is on your "must do" list. Thank you to management and staff for the most amazing stay. My husband and I went to Simbambili on our honeymoon and it was the most incredible experience. First of all, the accomodations were wonderful. Our villa was so beautiful and comfortable. I loved our deck with the plunge pool, the bathroom was nice and clean and our bed was so comfortable. They even gave us a gorgeous honeymoon turn down service complete with candles, champagne and a bubble bath! I have to admit, based on some of the previous reviews, I was worried about the food, but there was nothing to worry about. The food was spectacular - I loved every single meal that I ate. The lunch platters were a favorite and the final night we had a gorgous group dinner with a fire and the most incredible buffet. The service was also impecable. Our butler, Pretty, was so kind and helpful and the rest of the staff were incredibly friendly. Finally, the drives themselves were outstanding. Our tracker, Doc, and ranger, Matt, were so kind and knowledgeable. We saw all of the big 5 as well as some other rare sightings (like a pack of wild dogs!). Each drive was incredible and unique and probably the most amazing experience of my life. I loved my time at Simbambili and it was the perfect choice for our honeymoon. Suites at Simbambili are Morroccan-styled and offer a unique atmosphere and a different touch in the South African bush. Please note: Indicated price is for a 'Suite', which is the most basic room available at Simbambili. A single supplement may be applicable. Read all about travelling to Simbambili Game Lodge on our getting to Sabi Sands page. 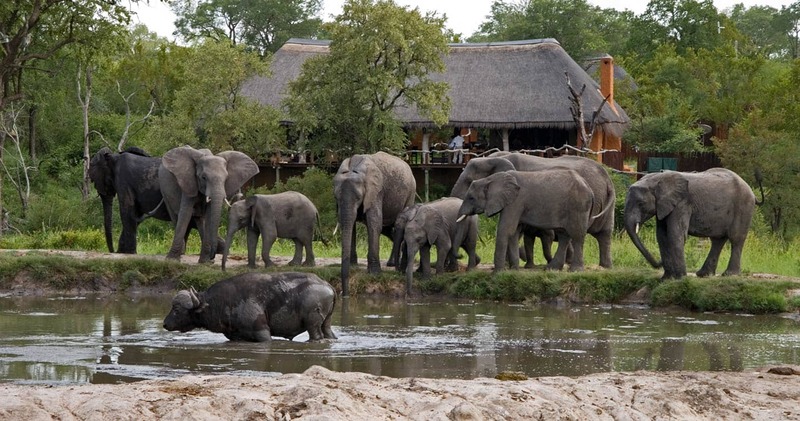 Simbambili is located in the northern Sabi Sands and therefore best accessed through Hoedspruit Aiport. Please note that Simbambili can only be accessed through Gowrie Gate when self driving. Simbambili welcomes children of 12 years and older. We hope you have found all information needed to decide that Simbambili Lodge in the Sabi Sands Game Reserve is the perfect place for your next travel adventure. Please fill in the contact form and we will get back to you soon!